May be it’s because I have grown up, but I somehow do not find this World Cup as exciting as the earlier ones. There is no mass hysteria this time. There are no bulk offers promising a TV, fridge, and washing machine for the price of a computer. Cricketers are not splashed all over the roads, peddling everything from hair oil to engine oil. And Coke and Pepsi have not slashed their prices. 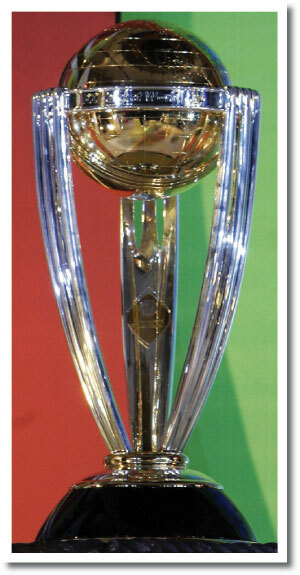 Cricket World Cups were the culmination of four years of discussion, debates, dreams and fantasies. We used to tear off the full-page matches schedule and stick it on our cupboards and disappointingly tick off one match after the other. This World Cup seems to have arrived without much fanfare surrounding it, even though it is being held in India. More than the lack of hysteria, there are a lot of other things in this World Cup that do not have my approval. Like the Opening Ceremony in Dhaka. I know they are an upcoming nation and need all the backing that they can get, but hosting the Opening Ceremony there is taking a bit too much. And the aerial cricket show seemed like an episode of ‘Entertainment ke liye kuchh bhi karega’. I was almost waiting for Anu Malik to break into another of his mind-numbing shayaris after the thing was completed. There were the same old dance performances and songs. I never understand, when there is talk of Indian culture, why are there always dance performances? We only dance when we are drunk, when no one is watching in the bathroom, or when our friend is getting married. Why do all the representations of India’s culture have to have dance performances?? And the Pre-match show is another disappointing part of the World Cup. Before the first match, there was a good intro by Harsha Bhogle about his experiences in the WCs. Then, the camera panned to the right, and my heart sank. Sitting to the left of Bhogle, was that man. That dreaded, feared man who can make the most interesting cricket match as enjoyable experience as smooching Baba Ramdev. Navjot Singh Sidhu is a threat to the nation’s sanity and needs to be removed from that panel in public interest. Poor Ganguly, if he is made to sit next to Sidhu everyday for the entire WC, he will retire from Knight Riders, sell his 22 cars, write an apology letter to Greg Chappel and retire to the Himalayas to lead an ascetic life. But on the flip side, there is no Arun Lal in the commentary panel, which makes life a little better. The advertisements in this World Cup are also dumb. All World Cups have had advertisements that have been part of the memories of the World Cup. Like the ‘Nothing Official About it’ ads in 96, the ‘Pad up Sachin, you’re on’ in 99, and the ‘Thanda Matlab Coca Cola’ ads of 2003. But the ads of this World Cup are sad, to say the least. All the TV ads show the person in the TV jumping out into the room, the insurance guys are still hell-bent on scaring you into buying a policy, and the Pepsi ads with the cricketers donning body paints on their bodies with a tight expression on their faces is too much to look at. So with so many things to crib about this World Cup, let’s hope the cricket is at least, worth it. This entry was posted in Cricket on February 20, 2011 by . I guess the England matches have given some worth to cricket! cannot agree more and just to add….the poor format makes this WC all the more boring where the real stuff starts only in quarters.